This is something like a non-linear weblog. It's not organized along a timeline like a diary, it rather is a growing net of opinions that I find worth sharing, following the guidelines in the about page: Imagine we are sitting at the counter of our favourite pub and are discussing all kinds of things. This site is a monologue, but please feel encouraged to answer by email (schneiderp-removethis--at-- gmx--removethistoo--net). Please mention if I may cite you in updates. It's an experiment and may be embarassing, both for the author and the reader ;-). Nov. 16., 2016 — Delays and stalinoid purgings in the transition team. "If you think education is expensive, try ignorance." Applied to the establishment: OK, let's try amateurs. The first impression is not promising. It is interesting that the vetting which primary and main campaigns normally provide has not fully happened with Trump. Traditional successful campaigns ensure that the candidate is able to build, staff and run a big organization effectively. Part of it is to put competent people in key positions (and to know enough of such people), to delegate without detaching, to lead without micro-managing, and of course to get enough feet on the ground to canvass large parts of the country. Trump has side-stepped much of this; his campaign ran on a wave of media popularity more than on a traditional party organization. It had a comparatively small head-count. There were upsets in the campaign management, but it all didn't matter much in the light of his enormous popularity with his followers and his general media presence. It is perhaps noteworthy that his campaign (Breitbart's Bannon in particular?) judged the electorate better than most pollsters did, and guided campaign resources to places which mattered (and which anybody else thought were off). This reminds me a bit of Plouffe's and Axelrod's successful Obama campaign management in 2008. It may have been pure luck on the side of the Trump team; or it was an extraordinary capability to connect to the mood in the country. The latter would help them when Trump is president. We will now see whether the establishment was so much worse than a government led by a racist misogynist. How will Trump govern? What do we know about him? I agree with Peter Thiel that "taking everything he says literally" would be a fundamental misunderstanding. It would also not lead anywhere because he has made a lot of contradicting statements. So we have to judge him by his deeds. I can discern just one consistent principle guiding his actions: Enrich himself without concern for others. There is nothing wrong with that per se: It is the entrepreneurial paradigm, the capitalist Charaktermaske, as Marx famously worded it. (And while Marx found it despicable, I don't; channeling the individual pursuit of advantage does lead to more common wealth than other approaches.) Trump may have explored legal limits a few times, with his fraudulent "university" and tax dodging, but that is – in his own words – just smart, under his paradigm. The question is simply whether it is a good program for a government. This is just a detail, but one of the more disturbing ones. Trump doesn't read books. (My favourite quib is that he didn't even read his own, cover-to-cover.) He also doesn't have many. The New Yorker talked to Trump's ghostwriter Tony Schwartz: "During the eighteen months that he observed Trump, Schwartz said, he never saw a book on Trump's desk, or elsewhere in his office, or in his apartment." There is a photo tour through Trump's apartment which doesn't show a single book shelf. There are some single books scattered, but they appear to be picture books: about Muhammad Ali, or a Vogue volume. There are about five books stacked on Melanias's desk, with stuff on top. A video on that page of Ivanka's room doesn't show a book either. It may just show my own narrow-mindedness: But to me, not reading books disqualifies for the highest office. I'm just reading Ray Kurzweil's "The Age of Spiritual Machines" (more on that when I'm through) in which he extends Moore's Law to a "Law of accelerating returns". Its essence is that the results of research are fed back into the means of research, so that research and technical development are exponential processes. Moore's law is just a special case. 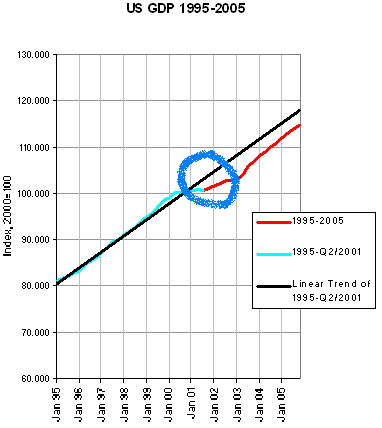 Now, if this pace of a duplication every 12 months can be sustained over a long time, that means that computer power continues to grow by a factor of 1000 per decade, and by a million in 20 years.2 Computers, Kurzweil says (and I agree), have the "intelligence" capacity of an insect brain "today" (the book is from 1999), and will have the human brain's capacity in 20 or 30 years. Even if one underestimates the human brain's power by one or two or three (!) orders of magnitude, the error will only make a few year's difference. There is no sign that this growth is controlled or slowed down or that there is any demand or initiative to do so, and in this light we probably think too little about the possible results. There is one minor effect that has an interesting implication at least from the perspective of a computer scientist: The well known categorization of computational problems according to the time needed to solve them (problems like sorting numbers, looking up a word in a linear text or the problem of the traveling salesman) is quite a bit transformed. Computer scientists fear the exponentially (or even faster) growing problems since they quickly become unsolvable in a reasonable time when the number of "things" grow beyond a certain level (number of citys that the salesman wants to visit, number of moves to look ahead in a chess game, and ah, yes, the number of bits in your PGP key). Well, you guess my point: If it is indeed a long term rule that the speed of computers is increasing exponentially, all these problems with exponential complexity are actually solvable in linear time. You just lay back and wait (or help develop faster computers in your spare time) until the speed of computers has caught up with your problem. A good example was the human genome project. Most of the work was done in the last 2 years; they could have saved a good lot of work and money if they had just waited from 1995 to, say 2001 or 2002, instead of starting with their ridiculous 40 MHz CPUs ;-). Actually, this is not quite true, since the non-computer equipment was certainly improved, and so were the specific computer programs in general. And, at some point you just have to start or you never get anything done. 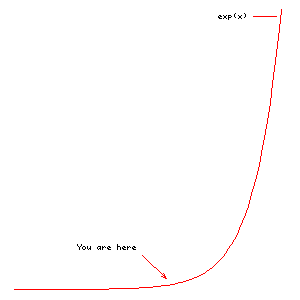 The nature of the exponential progress is just that you seem to have wasted a lot of money and energy in the first years of, well, almost anything that has to do with computers. And that's exactly my point. One of the greatest and in my opinion most underestimated dangers of the uncontrolled growth of computer power, bandwidth and storing capacity is the power to surveil and monitor people. It's only a minor, albeit annoying problem in a working democracy; it would be a disaster in a dictatorship. Any resistance will be futile, because it will be immediately detected. We are quickly moving to a point where no act of daily life will happen without leaving an external data trace. The most obvious examples are personalized electronic payments and traffic control like in London. The London example is quite scary actually, in particular because it raised so little concern; but also because it combines a 97% coverage video surveillance with pattern recognition in order to extract data (i.e. number plate numbers) from it, and links this data to personalized databases that contain the information whether the particular car owner has paid the city entrance fee. I think this is unprecedented. "Normal" surveillance is just plain video and usually needs a human in order to interpret it and link it to other information. This is, of course, slowly changing as pattern recognition software gets better. I also believe that paper money will soon be history in the industrialized countries. Unfortunately, the development is towards non-anonymous plastic money, mainly because it's so simple and also because shops and banks like the accumulated data for mining it. The principle that private data should be protected has become weaker and weaker over the years, mostly because the alternatives are so convenient (I'm buying quite a lot online lately, and I like it). I don't see any remedy. The technical progress in the field of data processing is so fast, and the driving forces (including IT professionals like me) behind it so strong that there is no chance to slow it down or to really control it. As far as technical or organizational data protection is concerned: I can't think of implementations that could not easily be removed if the need occurred. Just look at the current development in the US after the Twin Tower attack, or at the situation in West Germany when the RAF was active (cf. the so-called Rasterfahndung (German) in the late 1970s). The temptation to ignore acknowledged democratic principles in perceived or pretended emergencies is too great. I don't want to be too pessimistic. Cheap data store and access to it is perhaps making democracies more robust. Digital video is getting dirt cheap; surveillance can be mutual. An example are the grassroot initiatives called "Bürger beobachten die Polizei" (German) ("Citizens are watching the police") that emerged in the 1980s in Berlin and tried to document and prevent police excesses. It's much better to do that with a camera. In London, you probably don't even need a camera; but you need a freedom of information act and a president who does not declare the tape classified on the grounds of national security. So, after all, you better have your own camera, and that's possible now for everybody. Other examples involve the pictures soldiers take at war, and those that teenagers take when they harrass their class mates. But be aware that the cell phone that has sent the pictures will be traced down! The real problematic cases then may be those crimes that are not public. Or those crimes that are public but declared legal, like the extra-legal prisoner camps in Guantanamo on Cuba. But that's worth its own article. In my opinion, bringing the World Trace center down was essentially a symbolic act, and it was utterly successful in that. You may interject that bringing New Yorks highest building down, killing 3000 people in the process, has quite some material aspect. That is of course right. The point I want to make is that it is completely impossible to directly inflict significant damage to the economical or political system of a democratic country by means of terror. Consider that even the devastating hurricans in 2005 did not really affect the overall US economy. In order to shake the economy of a super power you need a full-fledged war (not a baby war like the one against Iraq), and cynicists might argue that even a big war would rather boost the economy than impair it if you do it right. Our political system is pretty robust with repect to terrorist attacks. In the case a leader dies, there are well-established procedures for succession. That's actually one of the main tests in political science to tell an undemocratic regime: Does the succession in leadership mean a crisis to the system? Killing a Hitler or a Ceausescu may change a country's course; but killing an American president or German chancellor most likely will not. Our economical system is very robust too, due to the underlying principle of self organization. The attempt to damage the economy by terroristic means is as futile as the attempt to stop an ant trail by putting pebbles in their way; the market economy just flows around damages and obstacles. So this is something that needs to sink in: The attacks were materially insignificant. I like the picture of a mosquito biting the elephant, which leads further in the argument: The only danger which the mosquito bite presents to the elephant is his own reactions. He might become mad, forgetting good practice of sound behaviour, and become a danger to himself and others. Thus, the deep and lasting impact that the 9/11 attacks had was not the direct damage; it was the impact on our souls and our spirit, and it was our emotional, economical and political reactions. That many people stopped flying, for instance, was completely irrational (it would have been very rational to have stopped driving instead!). We humans, and even more our societies, are "symbol processors". I think that the huge impact of the attacks on public opinion and emotion was partly owed to symbolic reasons. The pictures and metaphores connected to them formed an unusually powerful combination. The target and the means were carefully chosen. Bringing down aeroplanes is a standard terrorist pattern; it attracts a lot of attention not least because it ends mankind's old, always somewhat fearful dream of flying so spectacularly. One could possibly kill as many people by other means, and less risky. However, aeroplanes stay high in the terrorist "hitlist", and I think mostly for their metaphoric power. Now look at the WTC attack: It combines the falling airplane with an arrow-like attack; it also was targeted against a high-rise, a (male?) symbol for power and civilization on its own. The burning WTC looked like a torch that sent out the terrorists' message over miles. People jumped from 300 meters in desperation, again like in our worst dreams. In the end the high-rises collapsed. And all that happened at home, in the heartland. It was probably no news that there is no perfect security. It was the emotional power of a live demonstration which made it so powerful, not just the 3000 killed. 3000 is not very much, actually. In the US each year more than 40,000 people are killed in traffic accidents, so that the 9/11 attack corresponds to a mere 4 weeks of normal traffic. Additionally, more than 300,000 people are seriously injured in traffic accidents each year 3. It's seen as a technical problem. Imagine they would die in plane crashes. The London transportation authorities have published a very readable paper on the risk terrorist attacks impose on public transportation. They compare it specifically to the risk of transportation as such. Their surprising conclusion is that the greatest danger from terrorist attacks on public transit systems is that people as a result turn away from public transportation and drive to work instead; the resulting rise in deaths from car accidents would be much larger than the casualties of any conceivable attack itself. It's also noteworthy that US fatalities in Iraq (early 2006) are 2248 4, and rising; that causes political debate, of course, but no comparable emotions. If you are a religious person, this paragraph will hurt your feelings. I apologize for that, but can't help it. All religions are equally ludicrous, and should be ridiculed as often as possible. For some reason -- probably because of the current conflicts between muslims and christians -- this is one of the topics that bother me most. Well, frankly, I'm an atheist. I never believed anyway, and at the time in life when one forms an own opinion, as a teenager, I found that religion is just an escape from reality; in particular from the reality that our life is finite and the universe is (rather) infinite and we (as a race and as persons) don't play any particular role in it (but see some related ideas by Martin Rees). These are two cognitions that are quite hard to bear, if you think about it ;-). Unclear to me which one is harder to bear. But to resort to religion as an escape seems pathetic to me. Of course, most religions have many positive aspects. Usually they provide guidelines for social behaviour and also stabilize the minds of people who might otherwise be dangerously unstable. Their official organizations often engage in charity and social work like kindergardens or medical care; the Palestinian Hamas does this as well as the Catholic church in Germany. Last not least religion is soothing and thus falls into the same category of "nice to have" as a glass of red wine in the evening. For most of my life, I thought that religious belief is a bit off but tolerable, as long as it is moderate; as long as the god in question is one who does not interfere much with our world. But my opinion has quite a bit changed due to the religiously motivated conflicts in the Middle East, Ireland and Afghanistan as well as the growing influence of the religious wing in the US. Last not least I'm irritated by what one could call the global "New Muslim Movement", be it peaceful or not. No, I don't like any of the religions involved, and increasingly so. I think that the dangers involved with religion outnumber the benefits by a wide margin. After 9/11 and other Muslim terrorist acts it is obvious to any citizen that religion is dangerous -- until you mention that it's also true for Christianity ;-). I laughed a lot about the picture to the left (click to enlarge); it's stolen from the German satire magazine Titanic which I highly recommend. I hope that makes up for the copyright violation. The story behind it: The authorities had problems to expell or deport the radical muslim preacher Metin Kaplan ("Caliph of Cologne"). (Update Oct. 14th, 2004: Two days ago, he was deported in spite of pending court decisions, in a Lear Jet that was specifically chartered for this purpose.) 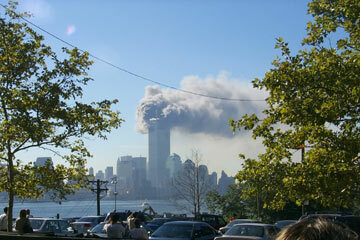 The story had broad media coverage in 2003 and 2004, and was fueled by general concernes about the Islam and Muslims. 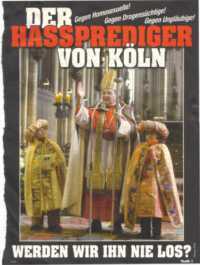 But Cologne is also in the West German Catholic heartland, with pretty extreme Catholic preachers who fight aspects of modern society in much the same way as Muslim preachers (well, perhaps slightly more moderate). 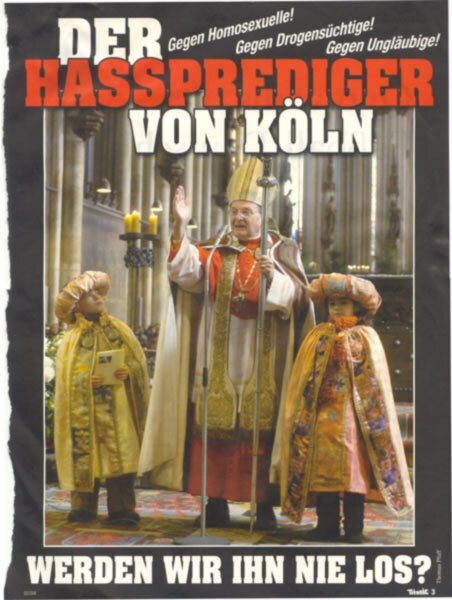 The text on the picture is "The Hate Preacher of Cologne -- Won't we ever get rid of him? ", and diagonal on the top right "Against Homosexuals! Against Drug addicts! Against Nonbelievers!" The fundamental problem with religion is that it is essentially irrational. It's simply not open to critique and debate; and that constitutes in my opinion a fundamental incompatibility with our western industrial democratic society. How would you call somebody who tells you that he hears voices in his head which tell him what to do? But that's the essence of religion. And these commands are absolute. End of discussion. Period. This attitude cannot be tolerated. Still, of course, I am a strong defender of the freedom of thought, freedom of of speech and freedom in general. Part of it is the freedom to adhere to the religion of one's coice, or to none at all; the limits are (not telling anything new here) where other people's freedom is materially inflicted. For example I think that women, men, apes and dogs and whoever should be allowed to wear scarves, not only in winter. The choice of clothes which you like should not be subject to laws or other public rulings. It's notable and reveals the tension building up that such a basic principle is challenged at all. My hope is that more reasonable and rational attitudes will catch on in a process of free exchange of opinions. And it's there, in the exchange of opinions, that I want to be intolerant. The main challenge is to keep this opinion exchange going. The real challenge is not to get through a particular opinion or a particular way of living. The real challenge is a meta challenge: to keep the process open and free by which democratic societies find their rules. Later note: Interestingly, a few days after I wrote this, I stumbled over an interview that Douglas Adams gave for an American atheist organisation, reproduced in the Salmon of Doubt (online here). I felt strongly supported by it. He mentions (also in other essays in that volume) that he was strongly impressed by The Blind Watchmaker by Richard Dawkins (find more of him at The Edge, strongly recommended, read the edge!! ), who challenges the special position that religions have in our society, namley exactly being exempt from the rational critique that any other opinion has to put up with. I must say that I feel in good society, and a well-humoured at that ;-). 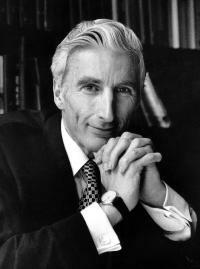 by Martin Rees is a book about existential dangers that mankind could encounter soon. I found it entertaining. It's largely speculative; most current threats (nuclear weapons, known genetically engineered organisms, climate change) are not really threatening to extinguish mankind, even not the technical civilization (although a nuclear winter would surely be no fun). The main general idea that makes Rees think that we are in danger is the following: Without knowing further details, the future life span of anything is likely in the same order of magnitude as the time that it has been in existence so far. Examples can be: broadway musicals (one that has been running for years will probably not be canceled in the next few weeks), stars, cars, people, political systems and, well, civilizations. The basic reasoning is that the periods in the life time of a thing during which the argument is wrong -- close to the begin as well as close to the end of its life -- are short in comparison to its overall life span. That can easily be seen in retrospect, but also applies to the future. It's essential to understand that it's a probability statement. It's by no means impossible, but just statistically improbable for an arbitrary object at an arbitrary point in time, that it's right then within the first or last 5% or 10% of the time of its existence. This argument resembles the anthropic principle, cf. the ongoing discussion at The Edge. The charm of this principle is that it works without knowing anything about the thing in question. Of course, there are an abundance of counter-examples, like new cars, babies or old people etc; but we choose these because we know something about them (we know how old people become on average, for example). Well, Rees applies this example to our technical civilization, which has been in existence only for a couple of hundred years. That thought isn't too comforting. The modern western society, with its benefits of the basic human rights guarantee at least for its members, is even even much younger. That means that quite drastic changes during our lifetime are probable (and happening, like climate change, pervasive computing and genetical engineering). Mankind as such isn't too old (a couple of 10000 years only). Rees' thoughts span widely; for example, there's no proof yet that there are other intelligent beings in the universe. On the contrary, it's a bit unexepected that we haven't had contact yet. If we are indeed the only ones, and consider intelligent life in this universe of any value, then we have a bit more responsibility as if mankind was just any of the many. This is no religious thought, it's rather a matter of taste or curiosity: Despite all the atrocities, I like mankind. It's such an interesting experiment. It's really exciting to imagine where we have come from (big bang, accretion disks, walking fish and all that), and it's no less exciting to imagine where we could go to, although it's quite a bit harder. Wouldn't it be a pity if all that went down the drain? So, after all, we may have more responsibility than we'd think at first glance. 1 A remark about the two sites. thenausea is quite voyeuristic and could be linked to ogrish.com (a pay site with violent content), judging from its contents and design. But it still contains material not seen in the news. thememoryhole, by contrast, appears to be what it claims in the about page, a site dedicated to publishing unwelcome information in the spirit of the first amendment and freedom of information principle. 2 I am (as well as Kurzweil is) aware of the physics that principally limit the acceleration of current microprocessors, most notably the speed of light and quantum effect errors with small electronic circuits. Therefore the end of Moore's Law as we know it, regarding the number of transistors per square inch, can already be seen. But Kurzweil argues, and I tend to agree, that new technologies will overcome these limits when necessary; think of quantum computers etc. 3 2004 report, Fatality Analysis Reporting System of the National Highway Traffic Safety Administration. Links to other reports are listed here.